Hi Everybody! Thanks for joining me for another terrific week of What Will You Stamp?! This week our challenge is to use Thankful Forest Friends. Upon first look it seems like it's a Thanksgiving set but I think these cute little animals can be used for just about anything. 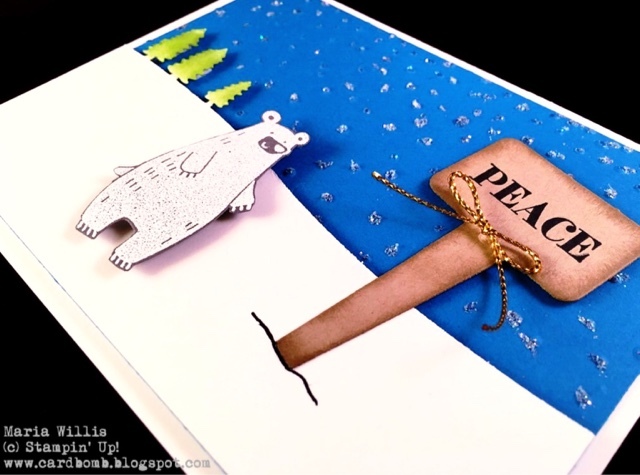 I decided to use the bear and emboss him in white on basic gray paper to make him a polar bear. I hope you like my winter scene! Here's a little close up of my polar bear and the sign. Do you recognize those trees in the background? They're cut using the Sleigh Ride edgelits and I used a sponge dauber to give them a little color. My sign was cut using the Hand Picked Framelits, stamped with the "Peace" from the Holly Jolly Greetings set and finished off with some sponging and a gold cording bow. My Pacific Point background piece was dry embossed with the Softly Falling Textured Impressions Embossing Folder and dusted with Dazzling Diamonds glitter powder. Here's the whole Thankful Forest Friends stamp set. Which stamp is your favorite? Want to see more cards made with this set? Come back and visit me on Saturday! I'm participating in a blog hop and this is the set I will be using. Want even more cards? Go check out the other WWYS Designers at What Will You Stamp?! We've got such a talented design team. I hope you'll go check them out! If you have a fabulous idea for this stamp set we would love to see it! 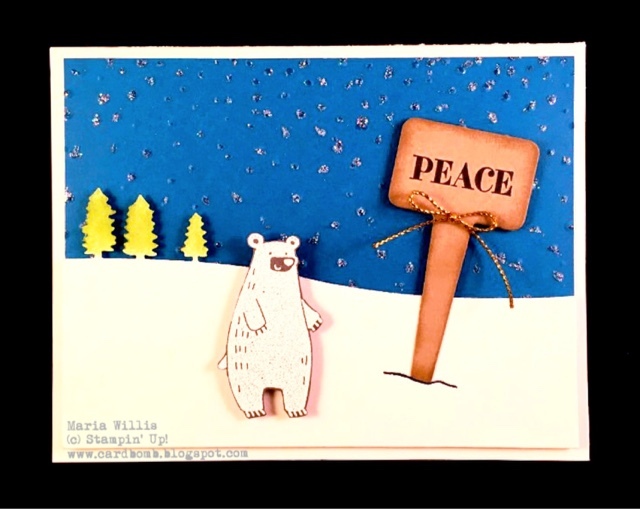 Please submit your cards or projects the WWYS Blog Page. I can't wait to see what will you stamp! Have a great day and Happy Stamping! Thanks for visiting me and I'll be back soon with more projects!